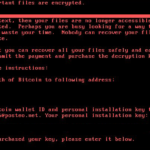 Hey !, I found this information for you: "Verwijder het Petya.A WannaCry Virus". Here is the website link: http://sensorstechforum.nl/verwijder-het-petya-wannacry-virus/. Thank you.